The heat had been oppressive for a good long time making poor old Winter Woman mighty miserable… and producing way too many, too big cucumbers in the garden. We designated Saturday as as Relish-Making Day (part 2). I put on a sun dress and sandals in hopes of staying cool during the preparations, cooking, and canning. To my delight, a weather-changing downpour ensued throughout the morning… clearing the air and lowering the temperatures. 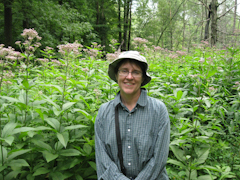 Here I am in front of a stand of very tall Joe-Pye Weed in the height of fashion in my borrowed adventure clothes. The dogs had been so patient throughout the morning that we decided to give them an adventure while the jars of relish cooled. I was without adventure clothes, so Terry loaned me jeans, shirt, and socks… and my own old hiking boots which I forgot I had left at his house for just such occasions. We headed down into the woods and started out on familar trails. We weren’t far into the woods before we saw some cool stuff… and I was glad I decided to bring the camera after all. At some point, we took a turn that led us in a direction we had never hiked before and we found ourselves in a huge beaver meadow… the lush open meadow left after a beaver pond is abandoned. We followed the creek which because of the rain was overflowing its banks and making wonderful rushing water sounds. All along the way the wet-loving flowers were flourishing – taller this year than I have ever seen them. There was also Boneset, but it hadn’t flowered yet – still just tight buds, but also very tall! I took this photo last fall when we approached it from a logging road rather than a beaver meadow. 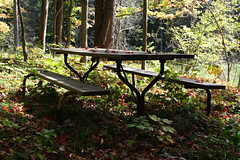 We weren’t sure where we were exactly… until we saw a picnic table… a familiar picnic table… from other wanders in these woods… We climbed up out of the former beaver pond to sit briefly and enjoy the view, before heading home again. It was a gorgeous, perfect walk. Couldn’t have asked for anything better. Oh! And I almost forgot! I saw the biggest grasshopper I think I’ve ever seen in these parts. He was gi-normous! In some countries, they might try to eat this guy! Advice for a pretty summer day: put on your adventure clothes and go exploring. Don’t worry about getting wet and muddy. That’s why they’re called adventure clothes! This entry was posted in hiking, wildflowers. Bookmark the permalink. jealous of your adventure and your spontaneity!! Great photos! Thanks for sharing your adventures with us! I had a lacewing on my deck a few days ago and was fascinated by his/her beauty. I didn’t know what it was called, but thanks to you now I do! And you’re right about that grasshopper – he is HUGE! I like your attitude: get out there and get muddy! And don’t forget to take your camera, there’s always something memorable to see. I believe your little mystery flower is Hemp Nettle, an introduced Mint Family plant that usually has pinkish/purplish flowers but they could be whitish as well. I showed the pinkish ones on a recent entry of my blog Saratoga Woods and Waterways. Having just come back from a month in the tropics, I have become accustomed to the heat. Gotta love it while it lasts. It is classified by United Plant Savers as a “To Watch”medicinal plant, as are L. cardinalis and L. siphilitica. I have some reintroduced on to my property as I am applying for designation as a UpS plant sanctuary. I(t only propagates by seed dispersal, I believe. I JUST found all your blogs and truly am enthralled by your photography! I will visit often. I just read Marian Prezyna’s comment, which had very interesting things to say about Indian Tobacco, a pretty little lobelia related to Cardinal Flower. Sorry to be so pedantic, but I know that Jennifer’s mystery flower is NOT Indian Tobacco, but rather, Hemp Nettle. Just go to GoogleImages and type in Hemp Nettle and you will find photos that confirm that ID. I appreciate your comment re the mystery plant. I must admit, I am not familiar with hemp nettle at all…. have not found it on our farm (or elsewhere, that I recall). My training and education has been primarily concentrating on medicinal flora, and that is where my mind automatically clicks the moment I find something that looks unfamiliar. Also I did not see your earlier post with your ID. Sorry! This is one reason why I qualified my comment with “MAY BE” as the photo only shows a few top inches of the plant, making it difficult for me to be certain as to its identity. Lobelia inflata was the closest to my herbal heart! Thanks for the educational opportunity.